When I Was ... is a monthlong series that will appear on this blog on Mondays throughout September. The series, by Star Tribune books editor and author Laurie Hertzel, moves chronologically through Hertzel's early years and adventures in writing and while on assignment at the Duluth News-Tribune. You can find the first entry in the series here. When I was 19, I started working as the newsroom clerk at the Duluth News-Tribune. 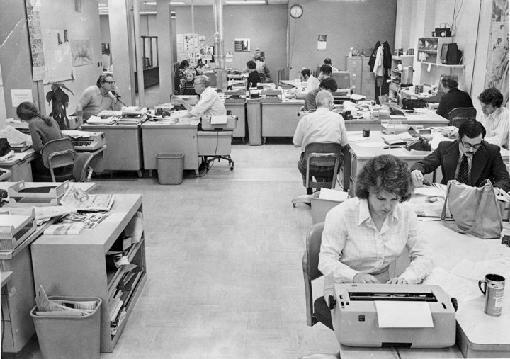 (Pictured above is the Duluth News-Tribune newsroom around 1978.) My job was to answer the city desk phone, write obituaries, call down to the harbor twice a day to get the marine traffic, and walk across the street to the county courthouse to collect information from marriage license applications, divorces, building permits, and bankruptcies. All of this suited the snoop in me very nicely, and I loved it. I did not have my own place in the room, but moved from desk to desk, taking over reporters’ vacated spots like a vagrant. In the mornings, I sat at the city desk, but in the afternoons, when the nightside city editor showed up, I had to find somewhere else to sit. This could be challenging, because the morning News-Tribune shared a newsroom with the evening Herald, and when both staffs were working, the room was crowded. More than once I found myself without a place to sit, and one day, my work mostly done, no typewriter or phone available, I took my book and went and sat on the floor by a window and started to read. Some of the reporters thought I was making a political statement about the overcrowding, and they cheered me. But really, I was just passing the time until someone went out on assignment and I could nab his desk. I was far too shy to make a statement like that, even if it had occurred to me. In those years, I felt myself not exactly a part of that room, but an observer of it. The newsroom was full of larger-than-life characters, fascinating people that I never tired of watching as they went about their work. There was a sportswriter—quite famous, locally—who had been born with no arms below the elbow. He could still type 100 words a minute, though, using rubber-tipped rods that clamped to his upper arms. There was a chunky, fast-walking copy girl whose job it was to run down the hall to the composing room with sheaves of typewritten copy and wire photos. She once called in sick because she said she had scratched her eye on her pillow—a truly bizarre injury that I figured must be a fluky, once-in-a-lifetime thing. A couple of weeks later, she called in sick and said it had happened again. There was a copy editor who once cross-country skied to work in a snowstorm, six miles from Lester Park, put out the morning paper, and then, when the storm didn’t abate, slept the rest of the night on the newsroom floor. There was a former mayor turned reporter, and a big burly guy who covered the waterfront—and who took the month of November off every year to work on the docks himself. It was legend—I wasn’t there at the time and cannot promise that this is true—that he once walked to work in a blizzard, crossing the Blatnik Bridge from Superior, a bottle of whiskey tucked under each arm. One was for the way to work, and one for the way home. Me, I was not a character; I was just a shy person sitting in the corner, and, occasionally, on the floor. Laurie Hertzel is author of News to Me: Adventures of an Accidental Journalist, published by University of Minnesota Press. Click here for more information, including a list of upcoming Minnesota reading events and links to Hertzel's website and Facebook page. You can also check out the News to Me book trailer. I love this. The things you saw are remarkable. I can picture these characters, having grown up on the Duluth papers it is a treat to be taken back in time, thanks. It seems the characters rubbed off a bit on you, Laurie-at least enough so that you were able to move among them freely...! Thank you for your blog post(s) here and at threedogblog - they have helped me rediscover memories and reminisce about old friends and great times.